December 3, 2018: On December 7, 1914, Pope Benedict XV suggested a temporary hiatus of the war for the celebration of Christmas. The Germans agreed, but the British declined. However, during the Christmas season, spontaneous truces broke out all along the Western Front, as French, German and British troops crossed the line of battle to sing, exchange gifts and even engage in an impromptu game of soccer. 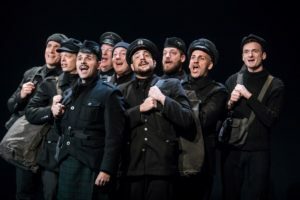 Interspersed among the songs is the heartbreaking testimony of the soldiers, first as they enthusiastically enlist for the hostilities they are certain will not last beyond the new year, then as they come to understand the awful reality of war. Drawing on firsthand accounts from the men at the front, Rothstein paints a picture of pain and camaraderie. 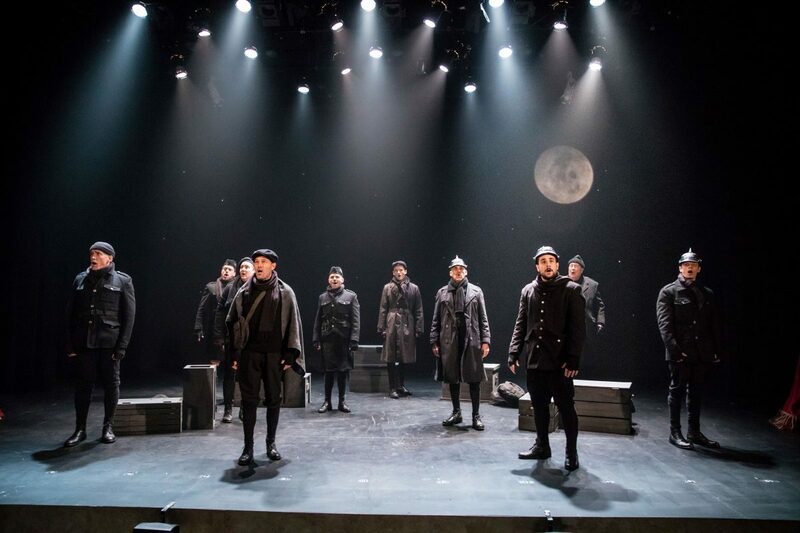 Marcus Dillard bathes the actors in doleful light, while Trevor Bowen dresses them in black uniforms that both indicate the soldiers’ country of origin and the universality of their conditions. The program begins with the Prologue and Optimistic Departure (with songs such as “Will Ye Go to Flanders?” and “God Save the King”) moves on to The Grim Reality featuring a less sanguine repertoire (“It’s a Long Way to Tipperary,” “When the Bloody War Is Over,” “Keep the Home Fires Burning”) climaxes with Christmas and The Truce (“We Wish You a Merry Christmas,” “Oh Tannenbaum,” “The First Noel” and many, many more) and culminates with The Return to Battle and the Epilogue and a reprise of “Stille Nacht,” when all is no longer calm and peace may be in heaven but certainly not here on earth. And the music is glorious, from Erick Lichte and Timothy C. Takach’s arrangements to the incredible harmonies these ten men achieve. Just hearing the unaccompanied human voice in all its glory is an unforgettable experience. All Is Calm debuted as a live broadcast on Minnesota Public Radio in 2007 and has since toured the U.S. as a production, playing in such venues as The Kennedy Center, Cal Performances, and the Metropolitan Museum of Art. It will be at Sheen Center until December 30.